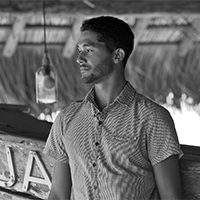 Three handsome young waiters, all brothers, are professionally busying themselves around me, taking orders, answering questions and freely chatting to their guests with an easy manner that’s typical of Trancoso. It’s early evening; golden sunlight bathes the make-shift football pitch that stretches across the ‘quadrado’ as two teams of local lads squeeze in the last few minutes of their seemingly endless match. Locals of all ages and a few well-dressed but low-key tourists saunter around or sit in groups under shady trees laughing and chatting with no particular sense of urgency. 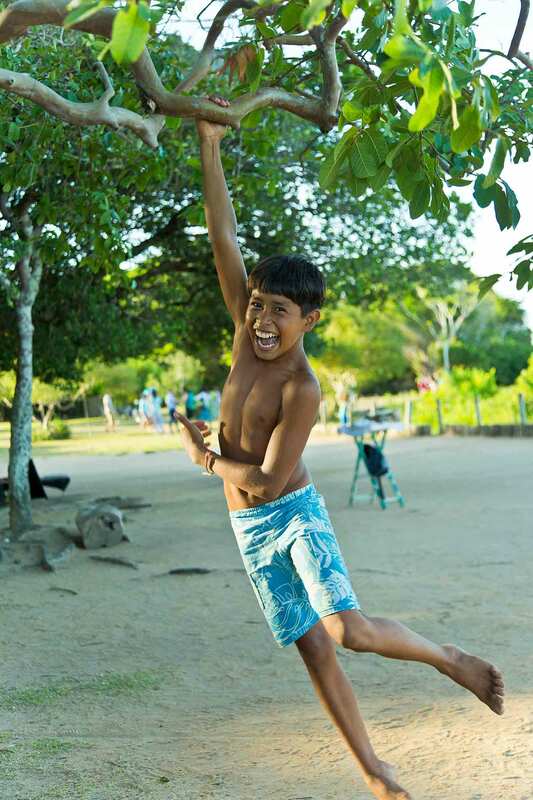 Fun-loving children play joyfully in the safety of the car-free, open spaces. To my left three local teenagers are sat on wooden chairs, two with violins and one with a cello, playing Bach with the competence of musicians twice their age. The sophisticated sound contrasts radically with their attire; baseball caps, board-shorts, t-shirts and bare feet. I’m sat at the modest, open-air restaurant of Uxua, one of the most desirable ‘casa’ hotels in the world, much loved by A-listers from fashion, film and music. Not that you would even know it, though. 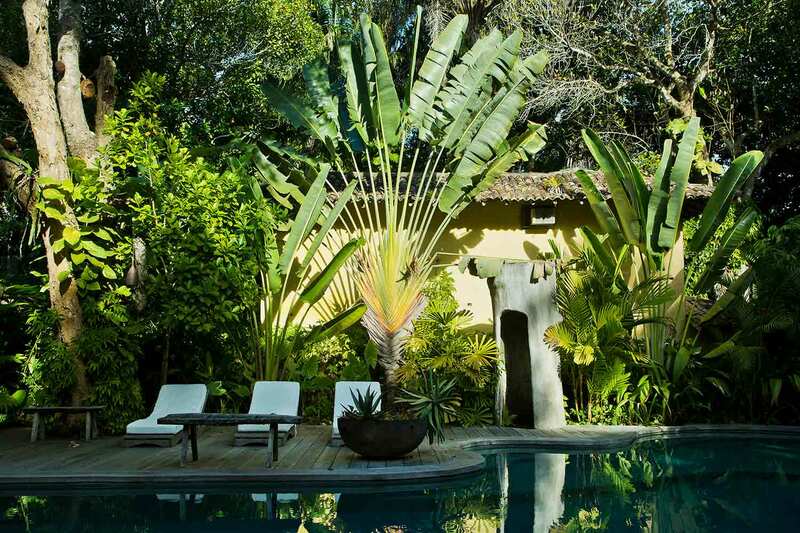 From the quadrado – the unassuming open village green which Trancoso is built around – only the most eagle-eyed would realise the hotel was there. No obvious signage or overt security, no perimeter fences or checkpoints separate it from its surroundings. But that is perhaps why it is so popular. 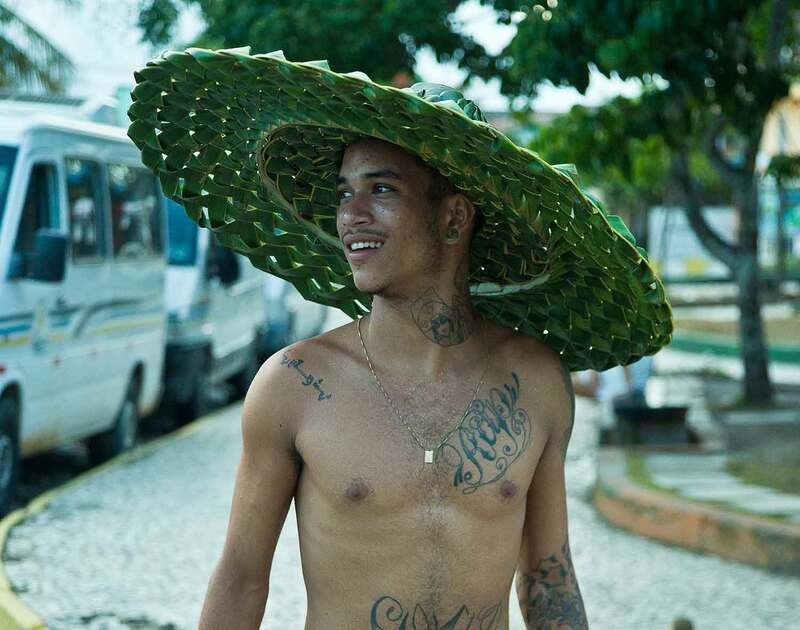 In Trancoso no-one actually cares who you are in the ‘real world’, you could be a superstar or a plumber, regardless of your ‘status’ or for that matter your race or gender, here you will be known by your first name and be treated just the same as anyone else. Now I know my description of the egalitarian, lack of pretension of Trancoso may fill the more cynical reader with a sense of incredulity, and to be honest if I hadn’t been lucky enough to have experienced it for myself, I too would probably not have believed it. 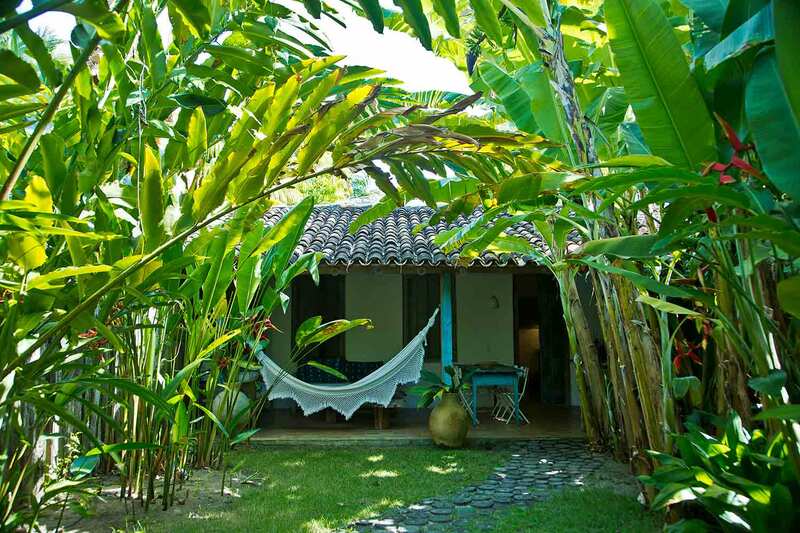 The live-and-let-live attitude of Trancoso also extends to differences in sexuality. Openly gay, Uxua’s owners Bob and Wilbert both tell me independently how homosexuality is a non-issue among the locals. Neither have ever experienced anything but acceptance – aside from maybe a bit of gentle banter, but no more than the good-humoured way that locals refer to Bob as a ‘clown’ due to his colourful and eccentric appearance. With a preference for loose-fitting, highly patterned, cotton trousers, tie-dyed vests, huge tribal necklaces, colourful woven bracelets and wearing his long, unkempt hair tied loosely into a ‘pineapple’ on the top of his head, Bob resembles the quintessential Burning Man drop-out, but don’t let that fool you. He and Wilbert (the ex-Creative Director of global fashion giant Diesel) are among some of the most astute, successful and intelligent businessmen I have ever had the pleasure of meeting. Bob, a keen amateur anthropologist, puts Trancoso’s accepting attitude down to a lack of the concept of shame in the remote, local culture. Despite being ‘discovered’ by the Portuguese some 500 years ago, the heavy hand of Catholic doctrine over time mixed with the West African-derived religion brought over with the slaves; which was then dealt a good dose of ‘hippy culture’ in the 70s and 80s. 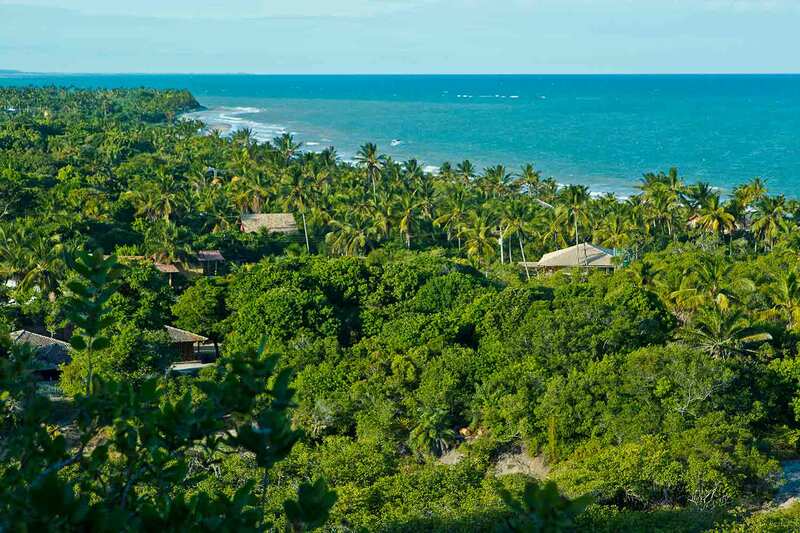 For nearly half a millennium, Trancoso was left to its own devices with very little outside involvement. After ‘discovering’ Trancoso, the Portuguese then attempted to colonise the area and ‘tame’ the local indigenous population into becoming a ‘respectable’, ‘productive’ workforce by converting them to Catholicism and forcing them to live in houses rather than nomadically in the surrounding Atlantic Forest. They forcibly relocated West African slaves to the area, in an attempted to farm the land. 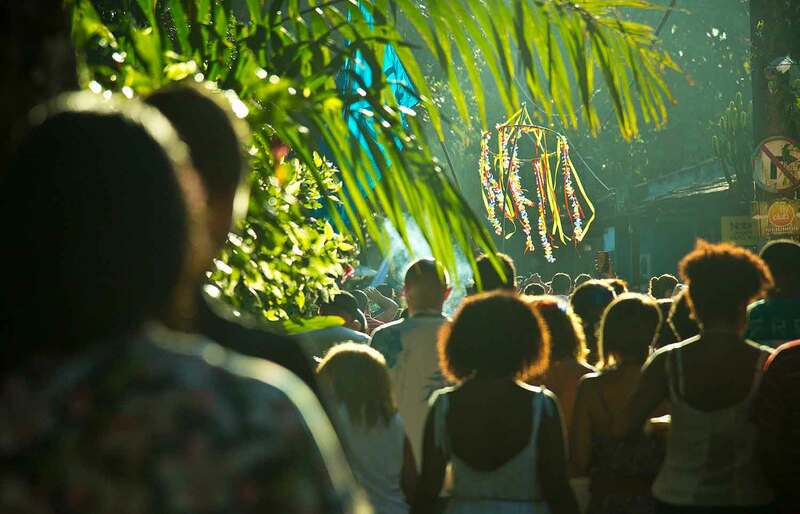 When the hippies came in, it made Trancoso a truly eclectic melting pot filled with tolerance and acceptance, rich in its appreciation of difference and a celebration of nature and life. This in turn led to a new generation who grew up with liberal values and whose experience of ‘Western culture’ included eating quinoa rather than french fries; and to whom the notion of ‘free love’ seemed in no way contradictory to the teachings of the Catholic church which itself has been tempered by the influences of indigenous and African-derived celebrations of fertility. This ability to celebrate seemingly opposing belief systems was demonstrated to me over the coming 24 hours. As I drained my cocktail, a table a few yards away caught my attention. Sat around it were perhaps ten village elders, amongst them two elderly twin brothers, one holding an acoustic guitar the other a ukulele. Without any perceivable signal they started to play and slowly, each of the men and women sat at the table began to sing. Over the next half an hour this jolly, but rather peaceful ensemble, steadily built in volume and intensity as more and more people joined in. Some played musical instruments, others just clapping, but every one of them sang with vigour. As darkness fell, the spirits of everyone in the quadrado rose – mine included – transforming the sedate village green into a raucous fiesta of dance, song and drumming. Suddenly, again with no clear warning, the swelling, exuberant crowd moved en masse across the quadrado and piled into one of the houses. 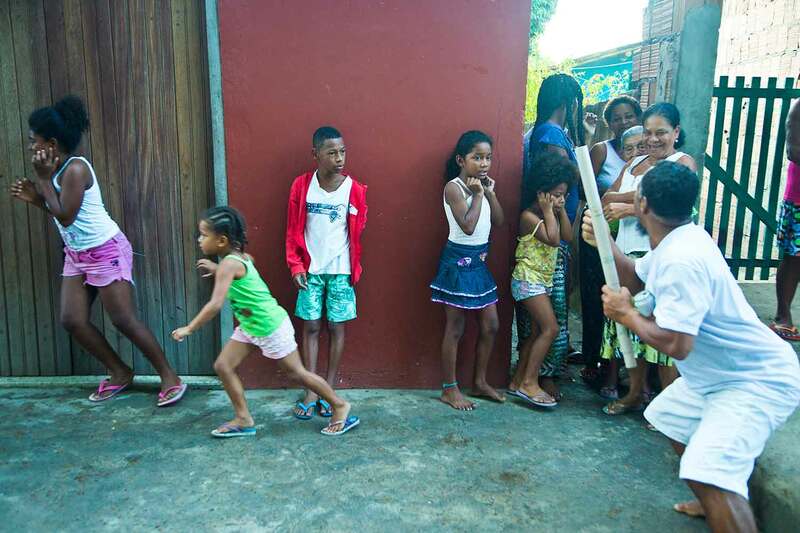 It was larger than the others and empty of any furniture; an open, brightly lit space filled with what seemed to be Trancoso’s entire population from toddlers to grannies, pregnant mothers to teenagers. Even some dogs were in on the action. The building shook with dancing bodies, raised voices and rhythmical drumming. All this was in celebration of Iemanjá, the West African goddess of the sea. An hour before sunset, villagers dressed in white had paraded around the quadrado before walking in a procession to the beach where offerings were passed to fishermen on small wooden boats and taken out to sea. The offerings, made to flatter and indulge the beautiful goddess, include white, fragrant flowers, fruits and sweets, perfumes, soaps, jewellery, and any other small objects which might enhance feminine beauty. 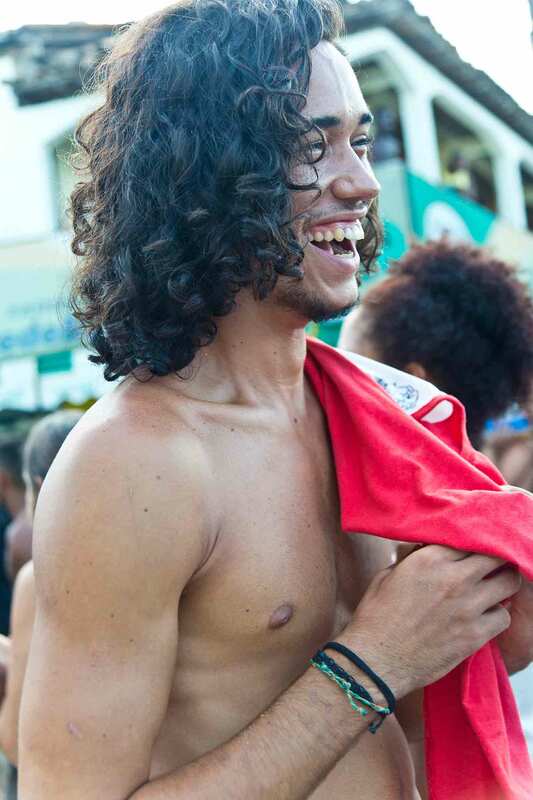 At some point in the night, the festivities moved seamlessly from celebrating Iemanjá to honouring Saint Brais. 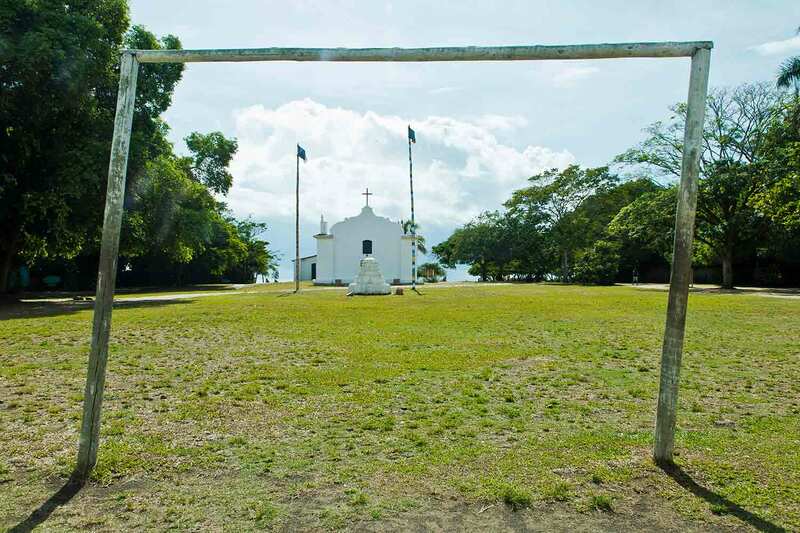 Just one of Trancoso’s three revered saints. The hours in between are filled with a marathon celebration, the acoustic instruments giving way to a sound system and a couple of bands, punctuated by the intermittent ear-popping cracks of fireworks – the first of the two religious ceremonies which bookend the festivities. At around dawn, those still standing – and there were surprisingly many of them – staggered out of the quadrado and up the mile or so through the village to a clearing where a 60’ long, painted, wooden pole lay waiting. Immediately all the women and girls ran to the pole and promptly sat upon it, to much hilarity and jeering from the men and boys, who after a few minutes managed to organise themselves into some kind of order to lift the pole onto their shoulders and carry it back to the quadrado, placing it just by the historic white church where it would lie for the next twelve hours. 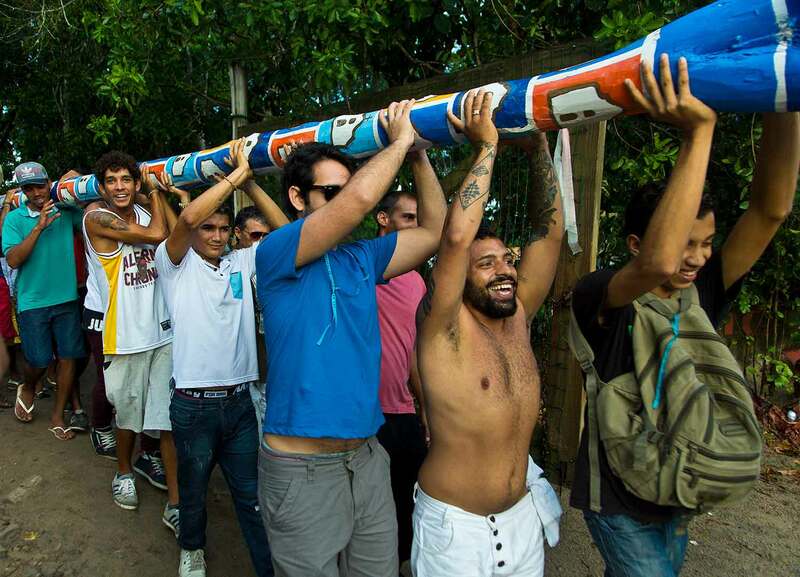 After a well earned sleep, followed by a feast and another procession around the quadrado, the entire village assembled once more to lift the pole into a hole in the ground. It’s a hair-raising spectacle as, the long, heavy pole spun wildly around on its axis, threatening to flatten the crowd below as it was lifted into place. that’s barely the beginning, I could wax lyrical about the many ingredients that come together to cast their spell and make one fall in love with this magical place… the freedom of expression; the ease with which the people break into song or dance; their warm smiles that match the warmth of the tropical climate; the fertile soil which gives sustenance to a bounty of flora and fauna; the effortless beauty of its handsome, often shirtless, smiling young men with their svelte, tanned physiques nonchalantly on display; the gentle good humour of the locals; the fact that the old are as integrated and outgoing as the young; their lack of pretension and their self-assured confidence. 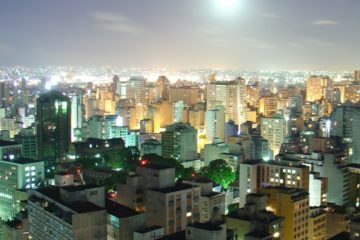 It became a running joke among my fellow travellers that perhaps we hadn’t survived the turbulence-battered flight from Salvador and had actually progressed to heaven. 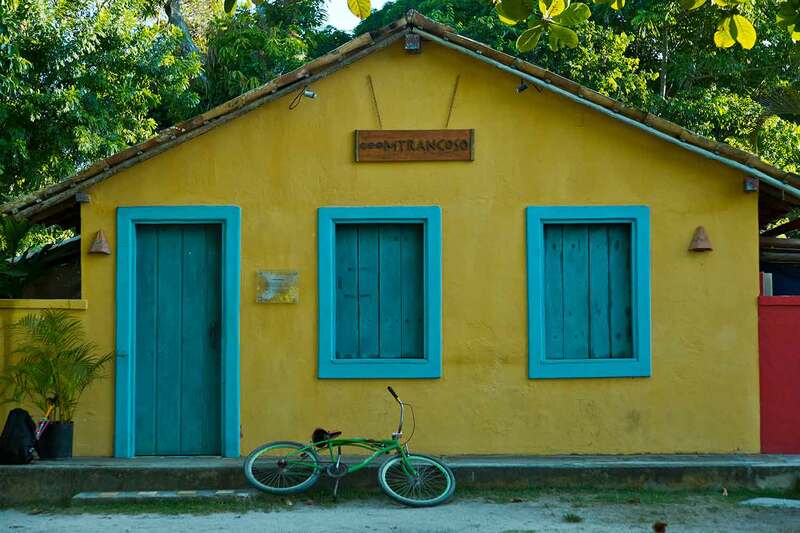 The charms of Trancoso aren’t lost on its locals, ask any of them where the best place in the world to live is and the answer will consistently be “Trancoso!” Being born here is to win the geographical and cultural lottery. Its outstanding natural beauty is accompanied by a vibrant, artisanal industry, supported in no small part by the steady stream of wealthy, adventurous visitors. It’s a place with a tolerant and forward-looking philosophy on life which fosters individual expression, but where community is central. 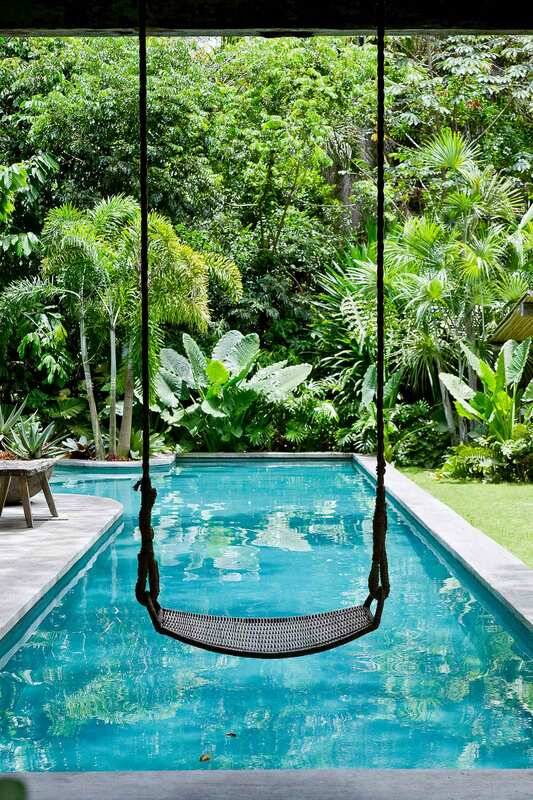 It is as close to paradise as you’ll get. 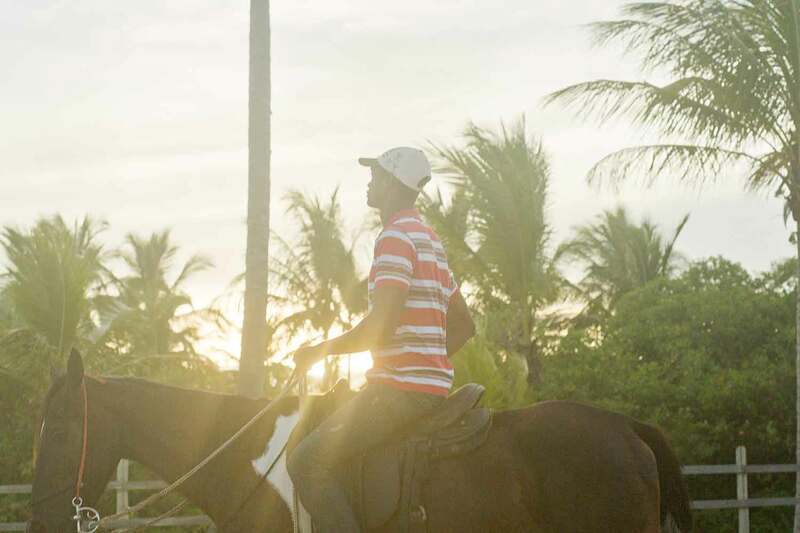 Martin’s trip to Trancoso was made possible by TAP Air Portugal, the flag carrier airline of Portugal, connecting London (and other major hubs) to Lisbon and onwards to Salvador in Brazil. Martin stayed at the absolutely stunning Uxua Casa Hotel and Spa. Take a walk around the Quadrado, it ’s full of hidden gems from small galleries to cute restaurants, sometimes hidden away behind the colourful little houses. Try Capoeira. Uxua has their own instructor who will take you through the history and guide you through the basic moves. Its a great work-out and a lot of fun. Invest in some local arts and crafts. 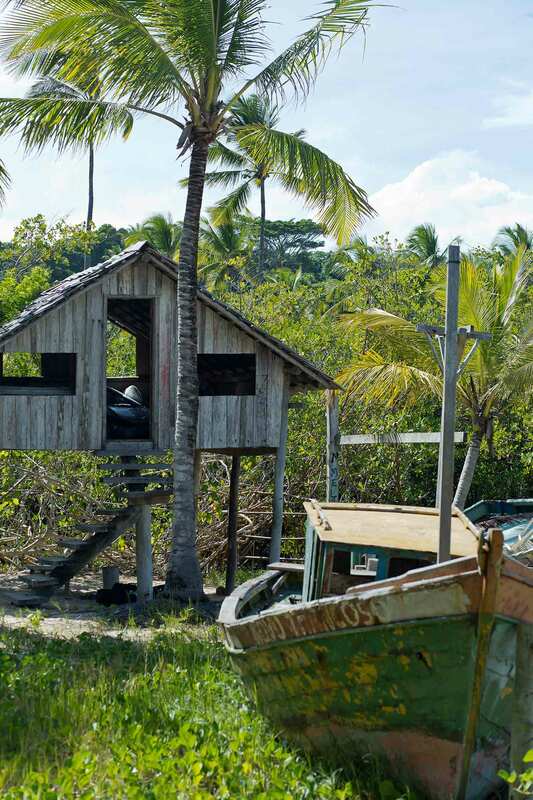 By suppor ting local crafts you are helping to keep Trancoso’s micro-economy going and in turn safe for future generations to enjoy. Don’t be anti-social. As tempting as it is to stay in your Casa, make an ef for t to talk to the locals. 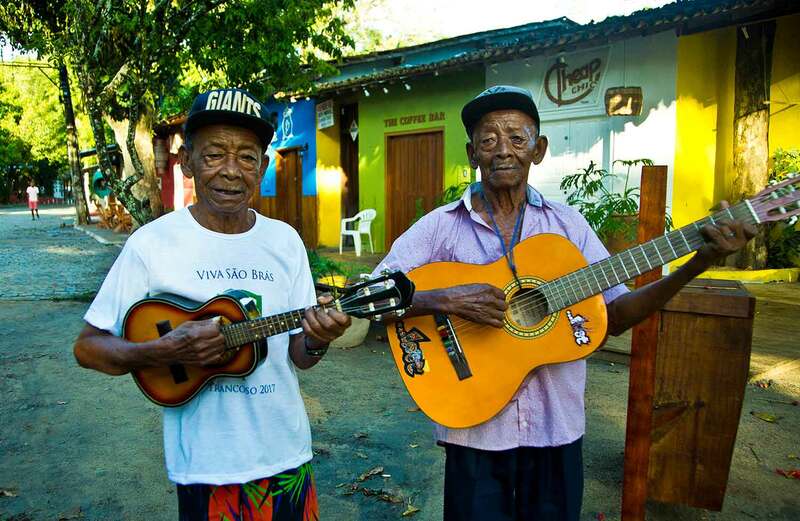 Trancoso residents are a good-humoured, friendly bunch and full of amusing stories. Take a ride along the seemingly never-ending beach on horseback. It ’s pretty amazing to feel the wind rushing through your hair as you gallop along the surf. Bring your camera! Or better still, pack some watercolours. We found we couldn’t help but feel inspired by this colourful, creative place. If you want something to take back home, I would recommend Divino’s decoration store or Ceramica Trancoso, where you can find a variety of handmade ceramic pieces and other locally made handicrafts. Both shops are at the Quadrado. One of my favourite places is a deserted beach called Itaquena, where I often spend time, to renew my energy and just stare at the beauty. It’s the perfect, escapist place to go for a walk, sit on the sand and enjoy the warm sea.